Looming in the background of Puerto Rico's humanitarian crisis is a mountain of debt. Long before Hurricane Maria left millions on the island without power or water, Puerto Rico was battling a financial crisis years in the making. Puerto Rico's crippling debt load -- totaling $73 billion -- forced the island to file in May for the biggest U.S. municipal bankruptcy in history. President Trump pointed out Puerto Rico's "massive debt" problems on Monday. Puerto Rico, Trump tweeted, owes "billions of dollars" to "Wall Street and the banks, which, sadly, must be dealt with." In reality, most of that money is owed to everyday investors. Less than 25% of Puerto Rican debt is held by hedge funds, according to estimates by Cate Long, founder of research firm Puerto Rico Clearinghouse. The rest of the debt is owned by individuals and mutual funds that are held by mom-and-pop investors. "For the most part, Main Street America owns this debt," Long said. "It's not as though these are vultures circling around the island." Investors piled into Puerto Rican bonds over the last decade, enabling the island's unsustainable spending-spree along the way. They kept buying Puerto Rican debt even as the island fell into an 11-year recession that deepened the debt crisis. High unemployment forced hundreds of thousands of residents to flee the island, further eroding the tax base. These risks forced Puerto Rico to pay high rates that lured bond investors searching for healthy returns in a world of historically-low interest rates. Another bonus: Puerto Rico's debt is "triple tax-exempt." That means owners of the bonds don't face federal, state or local taxes on the interest they earn. Nearly 300 bond mutual funds own Puerto Rican debt, according to data compiled by Morningstar. Some of the biggest holders include mutual funds run by household names like OppenheimerFunds, Franklin Templeton, Goldman Sachs (GS), BlackRock (BLK) and T. Rowe Price. Hedge funds that few Americans have ever heard of are also on the hook for billions in Puerto Rican debt. For instance, Autonomy Capital, a New York hedge fund run by former Lehman Brothers banker Robert Gibbins, owns nearly $1 billion of Puerto Rican general obligation bonds, according to court documents filed this summer. FCO Advisors, a hedge fund run by former Goldman Sachs municipal banker Hector Negroni, is sitting on more than $400 million of Puerto Rican bonds as well. Another key player: Aurelius Capital Management, a New York hedge fund that lists nearly $500 million in Puerto Rican bonds. Aurelius, run by Mark Brodsky, won big by playing hardball with Argentina for years following that country's default. Up until now, Puerto Rico's messy battle with its bondholders has played out in court, with dozens of cases being fought by parties that often have competing interests. This "maddening process" makes it "so bloody hard to get any kind of resolution," said John Rousseau, director of fixed income at Cumberland Advisors. The Florida firm manages about $150 million of insured Puerto Rican bonds owned by individuals. The devastation wrought by Hurricane Maria has shined a bright light on this glacial process that threatens to complicate the island's recovery efforts by cutting the territory off from borrowing money for years. There is hope that Hurricane Maria -- and the federal attention it requires -- could be the catalyst to break the logjam. Long said that the tweets from Trump, who has ample bankruptcy experience himself, may signal he's willing to bring the various parties to the bargaining table to reach a deal. "Puerto Rico cannot go forward with all of this litigation hanging over it," Long said. Of course, reaching a deal to renegotiate Puerto Rico's debt means that bondholders will have to take losses, known as "haircuts." Bondholders, most of whom haven't been paid for over a year, have long realized there will be losses. Some have already agreed to take them. PREPA, the island's electric utility, filed for bankruptcy in July after Puerto Rico's oversight board rejected a restructuring agreement with bondholders. How much federal aid will Puerto Rico get? Puerto Rico's debt crisis may also be eased by Washington. During the campaign, Trump vowed not to bail out Puerto Rico. However, it's clear that Puerto Rico, which is a U.S. territory, needs federal disaster aid. Some of the $15 billion Congress approved for hurricane relief after Harvey hit will be used for Puerto Rico. The White House is expected to send another request for disaster spending in mid-October. "It's the federal government's job to step in and get Puerto Rico rebuilt," said Rousseau. He called for something like the Marshall Plan, the massive federal aid provided by the U.S. to rebuild Western Europe after World War II. "Think of Maria as a bomb. The difference is this is our country, not someone else's," he said. Federal aid won't erase Puerto Rico's mountain of debt. But it could help revive the island's economy and prevent more residents from fleeing. San Juan Mayor Carmen Yulin Cruz urged Trump not to confuse Puerto Rico's debt problems with its humanitarian crisis. "You don't put debt above people. You put people above debt," she told CNN. --CNNMoney's Patrick Gillespie, Jill Disis and Julia Horowitz contributed to this report. 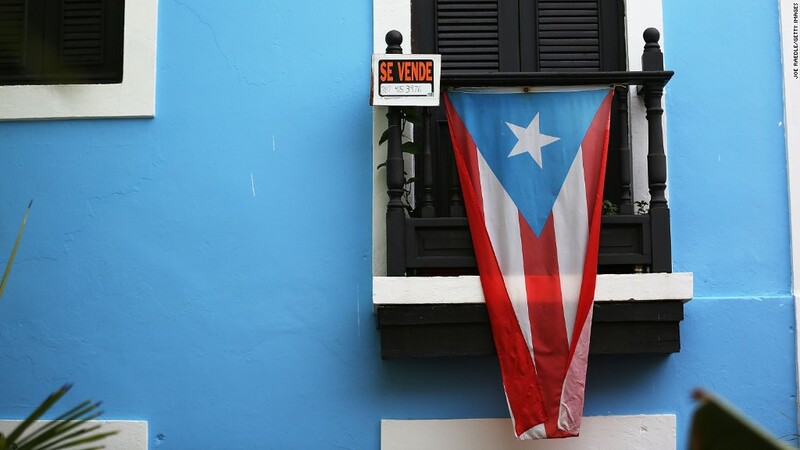 Editor's note: This story has been revised to reflect updated statistics from Morningstar on the number of bond funds that own Puerto Rican debt.